NFED Kumbungu: EVERYTHING YOU NEED TO KNOW ABOUT MEETING A CHIEF! TEAM NFED PAYS A COURTESY VISIT TO THE KUMBUNGU CHIEF. Photo by Emilio Dellanzo - The ICS and NFED team after a formal introduction with the chief and his elders. Every community has an ultimate leader. In a typical Ghanaian setting, chiefs are considered as the owners of the community and therefore serve as the ultimate leader. 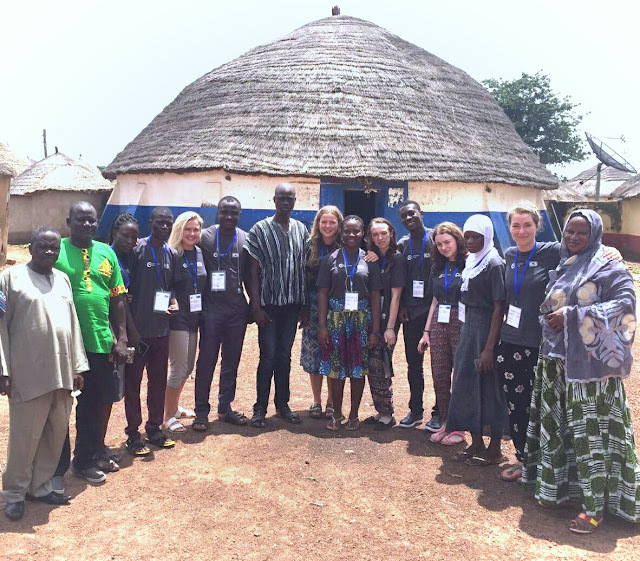 It is a necessity that the team embark on a visit to the chief of Kumbungu against the knowledge that, our activities as international Service (ICS) volunteers are going to take place in his sphere of authority and thus has direct influence on the communities under his care. 17th July, 2017 was as the first official day at work. The first activity of the day was a brief introduction of the work, expectations and the team's drafted plan and a formal introduction to the NFED staff of Kumbungu and together, we set off to visit the chief. On arrival, we followed directives as custom demands and we were set to meet the chief and his elders. Then our mission for the visit was asked. Now let me take you through the processes that occur when meeting a chief in the north of Ghana! Firstly, there is a form of communication between the chief and a drummer (luŋa, in the local language, Dagbani) where the drummer communicates from outside the palace, letting the chief know that there are visitors and he should get ready to receive them. Next, you take off your foot ware and enter the palace as culture demands. After this we then knelt in front of the chief and his elders in order to show our respect to him. This was important for us to do as it showed that we are ready to learn cross culturally. We were welcomed by the linguist and then our mission for the visit was asked. Mr Godwin Edem (In Country Team leader) responded by explaining in brief our mission and a quick introduction of the team was done. It is a point to note that communications in the palace are done through the linguist who serves as a mediator or translator who finds the best way to communicate to the chief. This is important because some ways of communicating words with the chief are seen as contempt and may attract fines so therefore the linguist is put in place to avoid this from happening. Mr Godwin Edem after introduction asked for the support of the chief and his elders to help us carry out our project successfully. He welcomed us to his home and assured us of his maximum support and security. He encouraged us to continue the good works we have started. He later confirmed us as residents of Kumbungu and assured us that we are entitled to every good thing any resident enjoys. As custom demands, the chief gave us cola nuts as a symbol of a peaceful welcome. An indication of a rich culture it was. It was an incredible start to our journey as volunteers and it helped us to realise that we are safe and secure here that we have the up most support from the chief and all the community within Kumbungu.